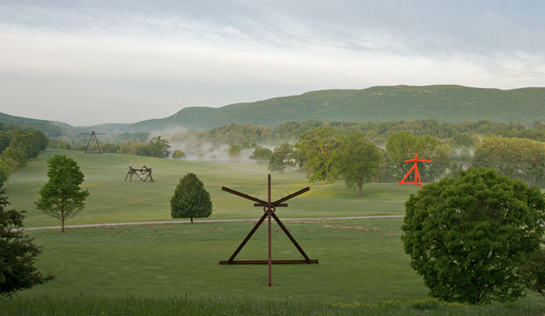 Sculpture parks or gardens creatively combine art and landscape, where they complement each other beautifully. Strategically placed sculptures in the garden evoke a sense of wonder and whimsy. Pieces can be abstract or realistic, and can serve as focal points at the end of a garden path or balance an asymmetrical landscape design. By studying these magical places, we can learn about such design principles as scale and balance, as well as design elements like form, texture and color, all of which can be translated to our own backyard gardens. We can even apply similar concepts by creating our own garden art with recycled materials and found objects. Florida, Winter Park: The Albin Polasek Museum & Sculp­ture Gar­dens is listed on the National Reg­is­ter of His­toric Places. You can also tour the artist’s historic home while gazing upon 200 of the artist’s works. Illinois, Chicago area: 60 sculptures are carefully sited amongst park trails and picnic areas of the Skokie Northshore Sculpture Park. Maine, BoothBay: The Coastal Maine Botanical Gardens offers a wonderful nature-inspired collection. Minnesota, Minneapolis: The Minneapolis Sculpture Garden is celebrating its 25th anniversary this year! New Jersey, Hamilton: Grounds for Sculpture (one of my favorite places) offers 270 sculptures, from contemporary pieces to life-size re-creations of impressionistic paintings, throughout its lovely landscaped grounds. New Mexico, Santa Fe area: At Shidoni Foundry & Gardens, in Tesuque, you can stroll through the 8-acre sculpture garden and even get to observe molten bronze being poured into ceramic shell molds! Pennsylvania, Philadelphia: The Ellen Phillips Samuel Memorial Sculpture Garden is the place to go to see events in American History immortalized. Washington, DC: The National Gallery of Art Sculpture Garden is conveniently located on the National Mall. Native plantings bloom amongst the outdoor art displays. The sculpture garden can even be enjoyed in winter when a large fountain converts to an ice rink.